Coleman 8-Person Instant Tent Review - Why Coleman is Best? Coleman 8-Person Instant Tent Review - Why Coleman is Best? If you love camping with your family and friends then this Coleman 8-person instant tent is the right choice for you. It is an instant tent which means it doesn’t take much time to setup. Coleman also allows you to accommodate your whole gang in one single tent and lets you enjoy, every single moment of your outdoor adventure. You can read here the Coleman instant tent reviews. Best Benefits – Why this Type of Tent is Best Tent on Amazon? This tent has been manufactured by one of the best brands in the camping industry: Coleman. The best feature about the Coleman 8 person instant tent is the amount of time that it takes to setup. Coleman tent can be fully setup within a minute without much hassle. The other great feature of this tent is that it is weather resistant, which makes it usable during any time of the year. Come rain or shine the tent will always hold up super strong. There are many other good things about this tent like it has the capacity to accommodate 6-8 people at once without making them feel cramped up. The tent also has an inbuilt rain-fly which makes it even more water proof during high rainfall. Coleman also comes in many different colors like blue, read, black etc. So you can always choose your favorite color. The reason why this is the best tent on Amazon is because of the features that you get in this price range. 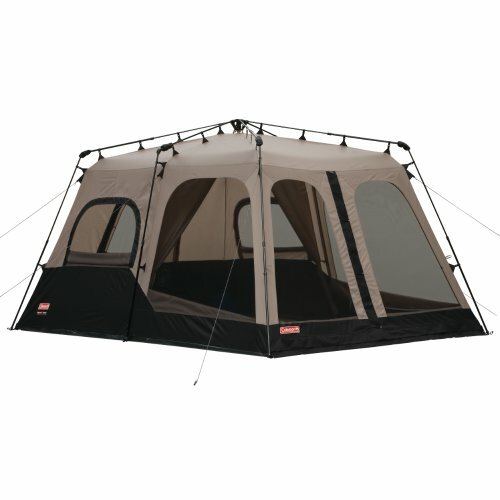 Most of the other tents listed on Amazon don’t have the same kind of features and the credibility of the brand in this given price. Hench, this makes it the best tent available on Amazon. This kind of instant tent is best suited for people who are looking to go on recreational camping with their family or friends and also for those who are looking for an instant solution for their tenting problems. The main reason why you need this the most is because of its high safety level. In general if you are planning to make camping an annual summer thing for yourself then the Coleman 8-person instant tent is a good product for your family camping needs.